Since winter is fast approaching, a number of companies are set to distribute their respective range of heaters in various designs and types. Due to the abundance of products and their diverse nature, it may be a daunting task to choose the right home heater based on your lifestyle. 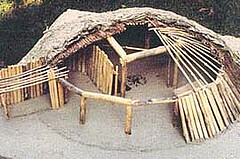 There are several factors to consider, such as the environmental impact, running cost, degree of heat in the room, etc. Further, natural gas heaters for your home are segregated into various sub-types, including electric fireplace, ceramic, wall heaters, oil-filled radiators, baseboard or free standing heaters. Generally, there are two popular types of room heaters, called convection and radiant heaters. Radiant are widely common, safe, effective, and can regulate temperature and automatically shut off. Convection products are designed to quickly heat up an entire room and may or may not require the assistance of a fan. These are generally not as powerful as radiant, but have a wider coverage area. 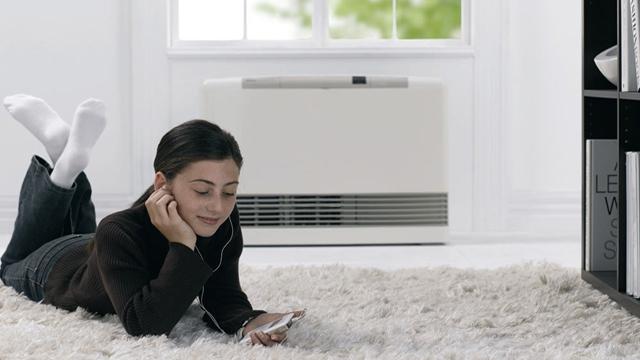 Let us take a detailed look at choosing the right heater for your home based on your lifestyle. Although such products may be costly, their running cost saves you money in the long run. This is because gas products produce about only one-third of the greenhouse emissions as compared to portable electric heaters. Such natural gas heaters for your home should be installed by an acclaimed provider, such as Jager Gas. Their services include installing a spectrum of appliances, such as pool heaters, gas heaters, patio and spa heaters. Unflued products may require room ventilation and are far less expensive than fluid gas heaters. However, fluid products are much more suitable for bathrooms and bedrooms. Electric products include oil-filled column, radiant, convection and fan heaters that are not very expensive but may incur heavy running costs. These are best used in small areas for a short period of time. However, keep in mind to look for a timer while getting these products, since they can amount to high utility bills if left running overnight. On the positive side, they are very convenient to use because there is no need to clean up splinters or ash. 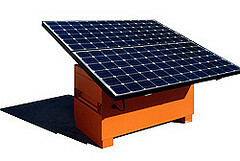 They are environment friendly as well and run on renewable electricity and are highly portable and versatile in nature. If you want to get a propane gas heater for home, it is a good idea to opt for a boiler or propane-powered water heater, called a radiant heat system. This system uses tubes that are embedded in the flooring and is considered to be much more effective than most central heating systems. The basic science behind its mechanism is that heat starts radiating from the floor and naturally spreads and rises throughout the room. 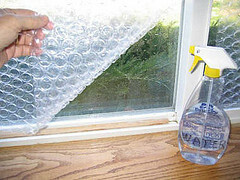 You can also insulate the water heater with a blanket to be able to use propane efficiently. Wood heaters are considered to be a lot more effective than a fireplace, since the slow combusting fire gradually heats up the room and releases all toxic heat out through the chimney. This is an energy efficient way to produce heat, since slow combustion fires contribute far less to air pollution than most open fires. They are great for large living or dining areas in your home. So, check your home and your lifestyle before you choose a natural or propane gas heater for your home. Obama’s new EPA administrator Lisa Jackson announced this past Tuesday that the agency would be delaying somewhere between 150 and 250 permits issued by the US Army Corps of Engineers to coal companies to flatten mountains and destroy watersheds in their desperate quest to extract the last of the sequestered coal with as few paid miners as possible. What the EPA will be reviewing are blatant violations of clean water regulations former President G.W. 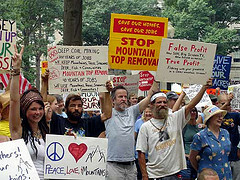 Bush waived in his 2002 “fill rule” and a last days repeal of the stream buffer zone rule that would allow coal companies to ignore any and all impacts of the water supplies of rural residents, towns and cities dependent upon these mountain streams for drinking water supplies. 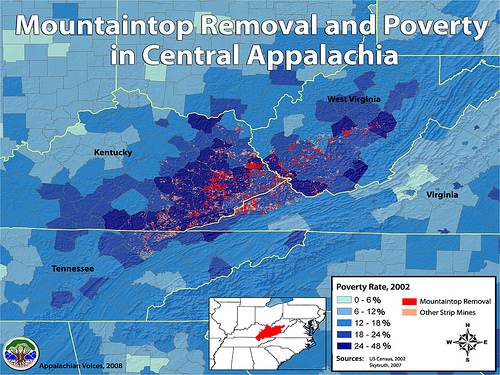 The map above (h/t Appalachian Voices) shows graphically how open strip mines and MTR directly affects the very poorest regions of Appalachia. One might suspect that these areas are happy to have the good jobs these operations offer, but the reality is that this kind of mining is equipment-reliant, done with machines and not men. For instance, King Coal once provided 120,000 decent paying jobs in West Virginia, but now fewer than 20,000 citizens call themselves coal miners. The people whose environment is being raped are getting nothing of value out of the deal. And may indeed be harmed significantly as their water supplies are systematically polluted, sickening their crops, livestock and families. As reported on this blog in several posts linked below, some of the people in these poor counties have better ideas about what to do with their mountains, things that will improve everyone’s life, make them leaders in clean, renewable energy supplies, and create green jobs for local residents. Especially check out projects like Coal River Wind, which proposes to harvest the wind instead of the mountain itself. 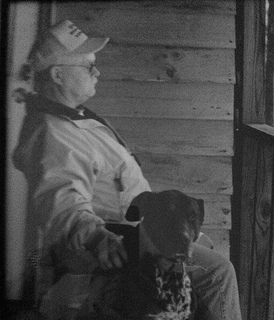 Another great article with good links and pictures is Hope is Alive in Appalachia!!! by Kossack ‘faithfull’. So get off your duff – call some legislators, sign some petitions, and spread some love of mountains in your circle today! Hope is Alive in Appalachia!! !